In This Game, You Have To Touch And Hold The Screen As Long As You Can And Avoid Monsters Or Obstacles From Being Struck. Don’t Lift Your Finger Otherwise Game Will Be Over. 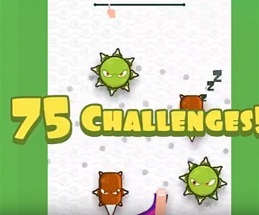 The Sequel Of This Game Brings New Monsters, 75 Challenges, New Challenge Mode, New Trails(Total 33). The New Version Will Be Out On 19th October 2017. Download First Part From Here.